Gate to Sam Garrett's Circle G Ranch in Sand Canyon, 1950s. Sam J. Garrett, b. Dec. 8, 1892, in Oklahoma, was a trick roper on the rodeo circuit, getting his start at age 14 with the famous Miller Bros. 101 Ranch in Oklahoma and going on to become a champion at Pendleton, Ore., in the 1920s. He did a bit of acting and stunt work, earning a starring role in "Flying Lariats" (Hooper Connell Corp./Big 4 Film Corp., 1931). 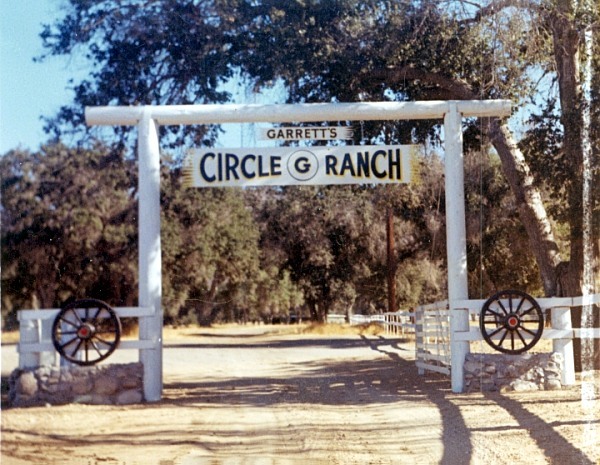 About 1940 Garrett and his wife, Ruby, came to the Santa Clarita Valley, establishing the Circle G Ranch in Sand Canyon, selling it c. 1963. Today it is a housing tract. Garrett moved to Fallbrook, Calif., and died April 4, 1989, in San Diego.